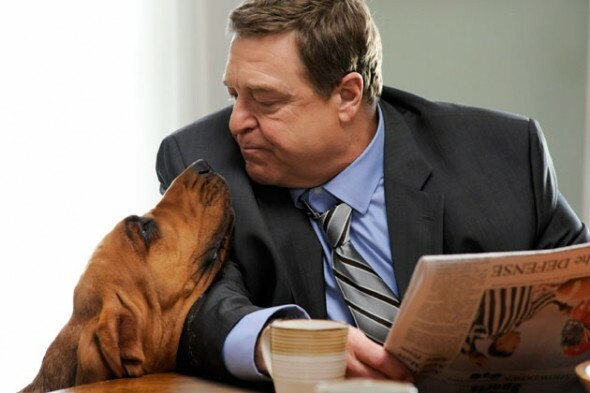 Amazon has announced that the second season of Alpha House will debut on Friday, October 24th. SEATTLE — Sep. 29, 2014 — (NASDAQ:AMZN) – Following the strong debut of Jill Soloway’s dark comedy Transparent, Amazon today announced it will premiere all 10 episodes of the second season of Garry Trudeau’s critically-acclaimed political comedy series Alpha House on Friday, October 24 exclusively on Amazon Prime Instant Video in the US, UK and Germany. John Goodman (Argo), Mark Consuelos (All My Children), Clark Johnson (The Wire) and Matt Malloy (Six Feet Under) will reprise their roles as Republican Senators living under one roof in Washington, D.C. dealing with the outrageous – and sometimes all-too-real – foibles of Beltway life. The series is produced by Trudeau, Elliot Webb and Jonathan Alter. Delivering hilarious insider insights from the master of political satire, the new season of Alpha House finds the Senators maneuvering the hallways of Capitol Hill with a looming midterm election and an unclear political future. Republican Senators Biggs (Goodman), Bettencourt (Johnson) and Laffer (Malloy), having survived bruising primaries, are facing strong Democratic challengers and will use every trick in the book to woo voters on the road to re-election. Meanwhile, Senator Guzman (Consuelos) prepares for a 2016 bid for the presidency, a pursuit that will bring him into possible competition with one of his roommates. Also returning for the new season are Wanda Sykes (Evan Almighty), Amy Sedaris (Strangers with Candy), Julie White (Transformers), Yara Martinez (Jane the Virgin), Alicia Sable (Dan in Real Life), Kobi Libii (Girls), Brooke Bloom (Extremely Loud & Incredibly Close), Ben Rameaka (The Wolf of Wall Street), Haley Joel Osment (The Spoils of Babylon), Natalie Gold (Love & Other Drugs), and Willa Fitzgerald (Royal Pains). Guest stars set to appear this season include Bill Murray (Groundhog Day), Penn & Teller’s Penn Jillette, Andy Cohen (Watch What Happens Live), Matt Lauer (Today Show), Savannah Guthrie (Today Show), Former Presidential Advisor David Axelrod, U.S. Senators John McCain and Elizabeth Warren, Janel Moloney (The West Wing), Marylouise Burke (Sideways), Tony Plana (Ugly Betty), Rachel Maddow (The Rachel Maddow Show), Former Democratic Political Advisor George Stephanopoulos (Good Morning America), Wolf Blitzer (The Situation Room), Jake Tapper (The Lead with Jake Tapper), Jane Pauley (CBS Sunday Morning), Former Pennsylvania Governor Ed Rendell, CNN’s John King, Andrea Mitchell (Andrea Mitchell Reports), Americans for Tax Reform Founder Grover Norquist, Alex Witt (Weekends with Alex Witt), and Toure and Abby Huntsman (The Cycle), among many others. Customers can binge watch season one of Alpha House now, exclusively on Prime Instant Video, via the Amazon Instant Video apps for Amazon Fire TV, Fire tablets, Fire phone, iPad, iPhone, iPod Touch, Roku, Xbox, PlayStation, Wii, as well as hundreds of other connected devices such as smart TVs – or customers can visit Amazon.com/PIV to watch online. Customers who are not already Prime members can sign up for a free trial at www.amazon.com/prime. Additionally, season one is available on DVD at Amazon.com. Amazon Studios most recently debuted Jill Soloway’s dark comedy, Transparent, with all 10 episodes now available on Prime Instant Video. Transparent joins Amazon’s first two prime time series, Alpha House and Betas, and first three children’s series, the Annecy International Animated Film Festival Award-winning Tumble Leaf from Bix Pix Entertainment; Creative Galaxy from Angela Santomero and Out of the Blue Enterprises, the creators of Blue’s Clues; and Annedroids, from Emmy nominated Sinking Ship Entertainment. Amazon Studios has also announced five additional, original series including Chris Carter’s The After; Michael Connelly’s Bosch; Mozart in the Jungle from Paul Weitz, John J. Strauss, Roman Coppola and Jason Schwartzman; and kids series Wishenpoof! from Angela Santomero and Out of the Blue Enterprises; and Gortimer Gibbon’s Life on Normal Street from David Anaxagoras, as well as a second season of Alpha House. Current pilots include The Cosmopolitans, Hand of God, Red Oaks, Hysteria, and Really. Amazon Original Series are available exclusively to Prime members through Prime Instant Video. Amazon Studios launched in 2010 as a new way to develop feature films and episodic series – one that’s open to great ideas from creators and audiences around the world. Anyone can upload a script and Amazon Studios will read and review all submissions. Those who choose to make their projects public will also receive feedback from the Amazon Studios community. What do you think? Do you like the Alpha House series? Do you plan to watch season two? More about: Alpha House, Alpha House: canceled or renewed? I just watched the first 4 episodes of the second season of Alpha house and Julie White is electric as Gil John Biggs wife. I wouldn’t be surprised if an Emmy nomination is not in the cards for her. I love Mark Consuelo as Andy Guzman as well. The casting in general is amazing! I think that the show is every bit as funny as Veep and that is saying something. Loved season 1 and was so looking forward to season 2. I tried to stretch out the pleasure by only watching one episode at a time. But by episode 4 I juster binged to the end. Janel Maloney, one of my favorites on WestWing, was added this year and plays this hysterically funny tea party wackadoodle. My only complaint is that the season ends with a BIG cliffhanger…I don’t know whether I can wait til next year to find out what happens. I loved season 1 of Alpha House, and look forward to binge-watching season 2. However, I will miss the fiesty Democratic Senator played by Cynthia Nixon.